Win Big and Give Back: It's the 2nd Annual #CXGivesBack Giveaway! Ah, yes, the holiday season: Another year is almost over. Another semester is almost behind you. It’s time to relax, spend time with family, hang out with friends, and catch up on some much-needed rest. It’s also the time of year when we all focus on volunteering and giving back—to our local communities, our national communities, and the world. And no one loves giving back like CollegeXpress. 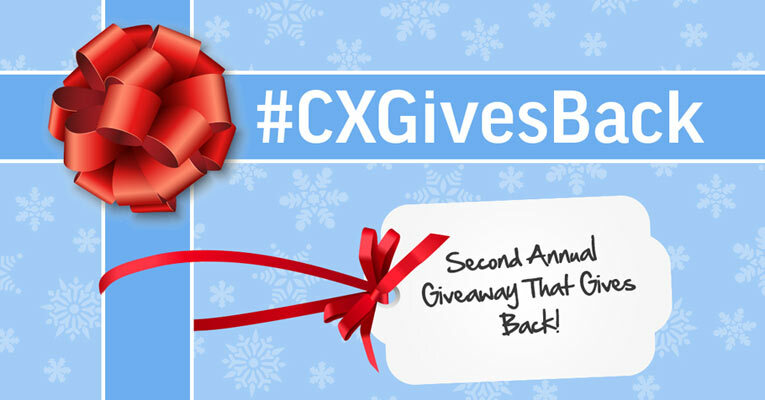 Welcome to the second annual #CXGivesBack Giveaway! That’s right—last year we had so much fun raising awareness for some great causes and giving students some of the coolest swag, we’re doing it again this year. From December 10 through December 21, we’ll have two weeks of fun (and easy) trivia, giveaways, cool content, scholarships, polls, and more. Every day there will be something new, plus a chance to win entries for the big giveaway bundle we’ll award on the last day of the contest. To keep everything organized, we’ve put together this calendar for you—make sure to bookmark it! How am I giving back? Each daily giveaway will revolve around charity, volunteering, and generally making the world a better place, whether it’s telling us what your favorite charity is or how you give back in your own community. There will be a giveaway every day, but the details are under wraps. You have to check the calendar every day to see what’s going on. Each day, one person who participates in our social media trivia or polls will be randomly selected to win an Amazon gift card or 4ocean bracelet—or both! And the cool thing about this is everyone who enters to win any of the daily giveaways will also be entered to win the final awesome bundle package on the 21st! Can I enter more than once or for more than one giveaway? Yes! In fact, you can earn up to four extra entries by tagging friends in your social media responses. Keep sharing, keep trying, and the more times you enter, the better your chances are to win the big final bundle. Four people will win $20 Amazon gift cards, one person will win a $50 Amazon gift card, and 11 people will win bracelets from 4ocean by playing along with our giveaways throughout the 12 days. Then one person who has entered the giveaways and/or played along with our polls and trivia will win one big bundle of awesome products from companies with products and missions all revolve around giving back. The more times you participate from December 10–21, the better your chances of winning the final prize! That winner will be notified by December 28. 4ocean* Bracelet: Every bracelet purchased from 4ocean will fund the removal of one pound of trash from the ocean. Faucet Face* Classic Design Variety Pack of Water Bottles: Faucet Face’s reusable bottles let people know you don't need to buy into the bottled water craze. A percentage of profits also goes to providing clean water filters in rural areas of India. FEED Cultivate Kindness Tote: Every FEED product sold helps provide food to children in need, and the total number of meals provided by your purchase is stamped on the item. Global Goods Partners Unisex Travel Pouch: Global Goods Partners is dedicated to ending poverty and promoting social justice by creating economic opportunities for women in some of the world’s poorest countries. Hand in Hand* Sea Salt Classic Ultimate Skin Essentials Set: For every product purchased from Hand in Hand, they'll donate a bar of soap and a month of clean water to a child in need. Ivory Ella Mandala Notebook: Ivory Ella hopes to stop elephant poachers and save elephant lives by donating 10% of their net profits to Save the Elephants, a Kenyan organization that tracks, monitors, and secures elephant populations. Out of Print* Library Card Mug, Composition Swell Bottle, Book Socks (two pairs), and Library Card Market Tote: With every purchase from Out of Print, you help fund literacy programs and book donations to communities in need. Project 7 Vacation Vibez Gum: Project 7 has paired up with nonprofits in seven different areas of need to make positive impacts in the United States and abroad. Pura Vida Bracelets Good Vibes and Never Give Up Bracelets: Each purchase from Pura Vida Bracelets helps provide jobs to over 200 artisans worldwide, and their charity collection donates 10% of proceeds to important causes. Sprout Pencils: The stubs of these pencils can be planted after use, promoting recycling and environmental sustainability. This Bar Saves Lives Variety Pack: This Bar Saves Lives is determined to end childhood malnutrition worldwide. Every time you buy a bar, they give food aid to a child in need. Yoobi* 10 Pack of Mini Highlighters, Journal, Mini Spiral Notebook, Composition Book, Spiral Notebook, 3 Pack of Gel Pens, Document Organizer, Pineapple Coin Purse, Tray Pencil Case, Tape Dispenser, 24 Pack of #2 Pencils, Earbuds, Pineapple Keychain, 3 Pack of Retractable Ballpoint Pens, Mini Stapler, and 3-Ring Binder: Every Yoobi item you purchase helps provide essential school supplies to classrooms in need across the United States. * These companies have graciously donated the items for this bundle. We’ll be showcasing them later this week, so keep your eyes out! Best of luck to everyone who participates! And be sure to find some time this holiday season or winter break to give back and make the world a brighter place. Check out the #CXGivesBack calendar here.